TEAM Informatics, Inc., a leading enterprise software products and systems integration firm and recognized expert in Oracle® WebCenter, Alfresco®, and a Google® Enterprise Partner, announced the alpha release of a Google Search Appliance (GSA) Connector for the Alfresco enterprise content platform. 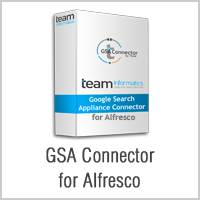 The connector product allows the GSA to index and search content held within the Alfresco repository, allowing customers to search content with the familiar Google interface. This entry was posted on Wednesday, November 13th, 2013 at 12:52 pm and is filed under Alfresco, ecm, Google Search Appliance, TEAM Products. You can follow any responses to this entry through the RSS 2.0 feed. You can leave a response, or trackback from your own site.